The Ireland skipper missed a good chance but was involved in the build-up of this screamer. WHILE THE REST of us focus on the imminent arrival of management ticket, Martin O’Neill and Roy Keane, Ireland skipper Robbie Keane was getting on with the day job. The Los Angeles Galaxy overcame Real Salt Lake 1-0 thanks to a thunderbolt from Sean Franklin in the MLS play-offs last night. The reigning MLS Cup champions dominated Real in the first half with seven corners to zero and 73 passes in their attacking third to Salt Lake’s 31. But despite a number of one-on-one opportunities, LA were unable to break the deadlock before half-time with both Landon Donovan and Keane failing to convert decent chances. It took just two minutes of the second half for Franklin to give the Galaxy the lead in front of their home crowd with Keane’s ‘cut-back’ finding the full-back, who unleashed a thumping 30-yard strike past Nick Rimando in the visitors’ goal. In the east, Omar Cummings’ goal in second-half stoppage time secured Houston Dynamo a 2-2 draw with New York Red Bulls. Email “Robbie Keane's LA Galaxy in driving seat after MLS playoff win”. 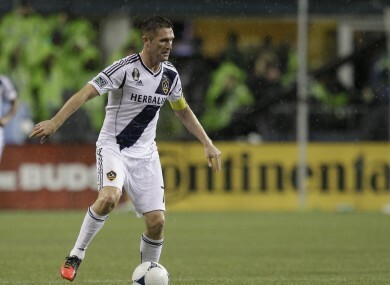 Feedback on “Robbie Keane's LA Galaxy in driving seat after MLS playoff win”.